A commuter account is an employer-sponsored benefit program that allows an employee to set aside pre-tax funds in separate accounts to pay for qualified mass transit and parking expenses associated with your commute to work. Get reimbursed for transit passes, tokens, fare cards, vouchers, or similar items entitling you to ride a mass transit vehicle to or from work. The mass transit vehicle may be publicly or privately operated and includes bus, rail, or ferry. Van-pooling is not to be confused with carpooling. Van-pooling requires a commuter highway vehicle with a seating capacity of at least 7 adults, including the driver. At least 80 percent of the vehicle mileage must be for transporting employees between their homes and workplace, with employees occupying at least one-half of the vehicle’s seats (not including the driver’s seat). Mass transit has always been eco-friendly and a great way to get some work done on your commute, but there is a new reason to get excited about your commute. Participating in a commuter account puts money back in your wallet. Contributions to a commuter account are free from federal and state income, Social Security, and Medicare taxes and remain tax-free when it is reimbursed for eligible expenses. If you pay for mass transit, van-pooling, or parking on your commute to work, you'll want to take advantage of the savings this plan offers. The chart below illustrates potential savings based on a variety of contribution levels. *For illustrative purposes only. Based on a 7.65% FICA, 15% federal tax, and 5% state tax. Your tax situation may be different. Consult a tax advisor. Monthly limits are set by the IRS. 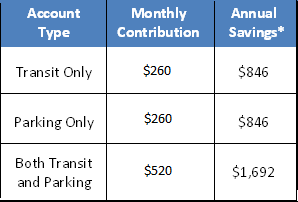 For 2018, contributions for transit and van-pooling are limited to $260 per month. Parking contributions are limited to $260 per month. Your monthly balance is carried forward and you can make adjustments to your contribution, join, or terminate plan participation at any time. You authorize your employer to deduct a pre-tax amount for parking or van-pooling/transit from each paycheck, up to the IRS limits stated above. You pay for the qualified transportation with your benefits debit card or you can pay out of pocket and then file a claim for reimbursement. Discover how this helps save both time and money on your commute.